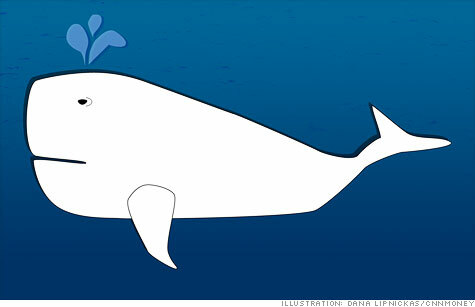 NEW YORK (CNNMoney) -- It now seems likely that a mysterious creature known as the White Whale might have taken a rather large bite out of superbank JPMorgan Chase's second quarter profits. What -- or who -- is the White Whale, you ask? The White Whale, according to the Wall Street Journal, is a JPMorgan (JPM, Fortune 500) trader based in London who has made a series of very large bets on credit default swaps, which are complex derivatives sometimes used to hedge against risk. His real name is said to be Bruno Iksil, and he works in the bank's chief investment office. According to U.K. regulatory records, Iksil has worked at JPMorgan since at least 2007. The White Whale is just one of his nicknames. His detractors have also dubbed him the London Whale and, of all things, Voldemort, the Harry Potter villain so sinister his name is seldom spoken. What exactly has the White Whale done to earn his unfortunate monikers? According to the Journal, Iksil's credit default positions were so large that they caused unusual market movements on occasion, prompting some hedge funds to make large opposing bets. And the unit he works in, the chief investment office, is now in trouble. JPMorgan CEO Jamie Dimon revealed in a hastily arranged conference call Thursday evening that the unit has suffered trading losses of $2 billion since the start of April. Net losses for the unit, after factoring in other securities gains, are expected to exceed $800 million by the end of the second quarter. And losses could increase depending on market conditions and the bank's actions moving forward. Yet it is difficult to say how much blame Iksil deserves, and whether his actions were approved by superiors. The bank's CIO unit is said to have evolved rapidly in recent years after the hiring of Achilles Macris, who led the trading group in London. According to Bloomberg, Macris "led an expansion into corporate and mortgage-debt investments with a mandate to generate profits" and the unit has now placed bets so large that "JPMorgan probably can't unwind them without losing money or roiling financial markets." The office's activities have also raised questions about whether they violated the spirit of the Volcker Rule. That rule, a part of the Wall Street reform law passed in response to the financial crisis, aims to ban risky trading by banks for their own profit, a strategy sometimes referred to as proprietary trading. The rule has not yet been implemented. "It's very unfortunate ... it plays right into the hands of pundits out there, but that's life," Dimon said on the Thursday call, adding that the trades "didn't violate the Volcker rule; it violated the Dimon principle."